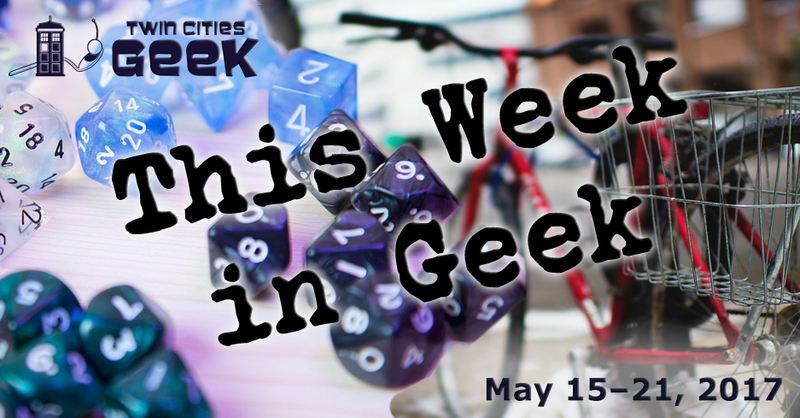 Welcome to This Week in Geek, your guide to events of interest to the Minnesota geek community for the week of Monday, May 15th through Sunday, May 21st. Lasers! Music! A variety of laser shows set to music, including Laser Hypnotica, Laser Zeppelin and more. Shows are $5 and open to audiences of all ages. Geek out to your favorite music and chill out with some lasers. When: Monday, May 15th at 6:30 p.m. When: Tuesday, May 16th at 7:00 p.m.
Café Scientifique, presented by the Bell Museum of Natural History, is “a happy hour exchange of ideas about science, environment, and popular culture, featuring experts from a variety of fields on diverse and often provocative topics.” This month’s theme is “Bringing Biology to Biometrics,” looking at how to foster collaboration between engineers and biologists for the important work of finding solutions to crucial problems based on how evolution has already solved those problems. The presenter will be Emilie Snell-Rood, an associate professor in ecology, evolution, and behavior. Tickets are $5 to $12 online or at the door. When: Tuesday, May 16th at 6:45 p.m.
United Geeks of Gaming will be assembling for Sporcle-based trivia at New Bohemia in Uptown on Tuesday nights. Sporcle is a team-based trivia night and has a focus on general trivia, so whatever you geek out about, you may be able to help your team. United Geeks of Gaming has a regular team, and attendees could also form splinter teams or go solo. The trivia itself is free; the food and drinks are not. When: Tuesday, May 16th at 5:00 p.m. In this casual game night, bring your own games or make use of Glitch’s tabletop game library. Organizers will be there to help teach games, and all skill levels are encouraged to attend. Come and experience YogaQuest, a blend of yoga and fan-fiction storytelling led by certified yoga instructors. Experience a yoga workout experience and a story at the same time. Work on your mental flexibility with this week’s theme: Clue! When: Wednesday, May 17th at 6:15 p.m.
Meet new friends in a fast-paced and fun environment with speed friending! During this event, participants will spend 3 to 5 minutes with each other before rotating and should be able to make some new friends by the end of the night. This event is $4.99 in advance or $10 at the door. When: Wednesday, May 17th at 7:00 p.m. When: Thursday, May 18th at 6:00 p.m. Co-Op Talk is a monthly discussion of interactive media and digital games held at GlitchHQ. The event begins with a short time to mingle and chat, with snacks and refreshments, followed by this month’s discussion topic: “Game Music Mixtape: Share, Listen, Discuss,” led by Andrew Herbst. When: Thursday, May 18th at 6:30 p.m. The Barony of Nordskogen (Minneapolis chapter of the Society of Creative Anachronism) is partnering with the Geek Partnership Society for medieval court-dance practice. Participants are encouraged to dress up if they like. When: Thursday, May 18thth at 7:00 p.m.
Allison Hiltner, a self-described archaeologist of science fiction and Minnesota Artists Exhibition Program artist, will be presenting the talk on her installation It Is Yesterday, focused on the symbiosis between humans and algae. She’ll be showing her installation, which is equal parts experimental laboratory and mechanized interior environment. This talk is part of Mia’s Third Thursday event. The Geek Partnership Society’s Crafty Geek club and its sub-club Make It Sew meet Thursday evenings at the Waterbury Center and invite you to “bring your crafty stuff to do” or to “hang out and work with the crafty stuff we have here!” This week’s special theme is dyeing. When: Thursday, May 18th at 7:00 p.m. When: Thursday, Friday, and Saturday, May 18th–20th at 7:30 p.m. This musical comedy from Fearless Comedy Productions follows Sandy and her constant companion, Anxiety, as they try to navigate life. In addition to May 18, 19, and 20, this show will also return June 2 and 3. When: Friday, May 19th at 4:00 p.m. Tap the week’s troubles away with a happy hour tap-dancing lesson at Can Can Wonderland. Get a little loose and learn a new skill while having fun. This is a free event, and some tap shoes are provided. When: Friday, May 19th at 5:00 p.m. to Sunday, May 21th at 5:00 p.m. The Northeast Minneapolis Arts Association will be holding Art-A-Whirl during the weekend of the 19th throughout Northeast Minneapolis. See the works of over 600 artists, attend concerts, see artists demonstrations, do hands on crafting, view galleries and more. There’s a lot to do at Art-A-Whirl, so check out this FAQ to help plan your visit. Come and see what Northeast Minneapolis has to offer. When: Friday, May 19th at 5:00 p.m.
Another event this week at GlitchHQ, Lounge 2.0 is a get-together for people who are passionate about games and want to spend their Friday nights in like-minded company. Glitch offers consoles, PC stations, tabletop, and digital games. If you’re passionate about a game, bring it to share with the community. When: Friday, May 19th at 6:00 p.m. When: Friday, May 19th at 10:00 p.m.
At this social event for cosplayers, costumers, and other crafters, you can “talk about how-to’s, where-do-you-get’s, and anything else cosplay/costuming, or just life in general.” Meet up, have a drink, and hit the dance floor. The gathering officially ends at 11:30, but you can stick around afterwards for the midnight lip-sync contest. No cover if you’re in costume. When: Saturday, May 19th at 8:30 a.m.
After gaining all of this experience with various yoga poses, you’ve earned the right to level up and dive deeper into familiar poses, and even learn new feats (poses). There is a $15 charge for this advanced class. When: Saturday, May 20th at 10:00 a.m.
Game, eat, and be merry at Byte with United Geeks of Gaming‘s open gaming. Byte has a number of board games on hand, but participants are encouraged to bring games to share, including board, card, miniature and role-playing games. Meet in the back room, and make sure to enjoy this geek-friendly space in downtown Minneapolis. When: Saturday, May 20th at 12:00 p.m. Celebrate Pan Asian Heritage Month at the Mall of America Rotunda with the sixth annual Pan Asian Arts Festival. This is a free event with non-stop activities including dance, performance, carnival games, and arts and crafts. Celebrate the rich cultural diversity of Asia and the Asian communities that are here in Minnesota. Enjoy Bloomington’s annual Kite Day celebration with music performances (including geeky favorite Harisen Daiko at 2:30), kite-flying contests, craft projects, and large kite demonstrations. This event is free, and there will be free kites for those 18 and younger while supplies last. When: Saturday, May 20th at 7:05 p.m. When: Saturday, May 20th at 10:00 am to Sunday, May 21th at 5:00 p.m. When: Sunday, May 21th at 12:00 p.m.
Shieldmaiden Sundays is a new dedicated space for lady nerds and geeks at the Source. This will be a recurring weekly event providing a space for women to play games, chat about comics, cosplay, or just enjoy the company of other geeks. So, which of these events will you be attending? What events would you like to see featured in the future? Let us know in the comments section below or contact us via email. Don’t forget to add your events to the Twin Cities Geek Community Calendar!